This is my second post about my plans to construct an online editing and color correction suite for my own work. Last time I talked about what computer equipment I would probably need in my edit suite. Now that I’ve got all this great (hypothetical) hardware, where do I put everything? I could just get a cheap desk and a folding chair, but that’s the wrong way to go. I need to work efficiently, and a plain rectangular desk is not the right shape for working with three monitors, a keyboard, and a tablet. I also can’t cheap out on the chair unless I want to get carpal tunnel syndrome. I also have other reasons for not skimping on furniture. For a production, online editing and color correction are some of the highest dollar-per-hour expenses. The equipment is expensive, the labor is highly-skilled (IMHO), and the time-frame per job is short. Clients rightly want to feel like they’re getting their money’s worth. It’s hard to see where that money is going if the equipment is in another room, and watching someone use a computer is notoriously boring. This expense is why million-dollar online rooms have track lighting, espresso machines, and leather couches. It’s similar to the broken-windows theory1. If I have a cheap desk and a broken couch, that implies I take the same attitude toward my hardware purchases — it’s probably a bunch of half-working cobbled-together junk. Sure, I could charge the client less if I didn’t spend so much on the decor, but the percentage of the budget spent on furniture is small compared to the hardware and software. Physical goods are more cost-effective than electronic, so a smaller amount of money goes a longer way. The most expensive piece of furniture is The Desk. Entire companies exist just for making media desks and furniture. These desks are very nice. They curve around, so the operator can look directly at all the monitors. They have risers, which provides more space for mixers, consoles, and other gadgets. They are also really, really expensive, like $3000+. 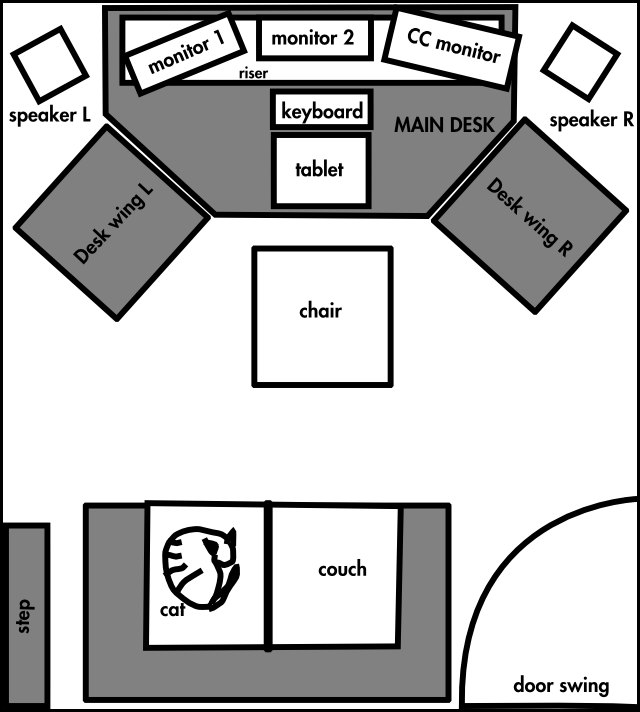 For the monitors, tablet, keyboard, and chair, I drew rectangles the same size as the items themselves. I let these objects determine the size of the desk. Right now the space between the chair and the couch looks a little tight, but the couch and door are estimations2. The speakers are shown free-standing, but I may end up just putting them on the desk. I wanted to get the wrap-around effect using simple shapes, so I started with a rectangular top and chopped the corners off. Then I can make two smaller wings that fit flush onto the diagonal sides. The wings may have four legs (so they can move), or I might give them only two legs and have them attach to the main desk. The riser consists of a simple bookshelf with some more board screwed and glued to elevate it. Note: I haven’t built this desk, so I may discover that the legs are no good or the particleboard counter needs reinforcement. This post is not sound construction advice. Is 560$ too much to pay for a good desk? It’s half the lowest price I’ve been quoted for either professional edit furniture ($3000) or a custom-made birch desk ($1000). It’s only 5% of the cost of the rest of the editing suite. Couch: I may have access to a free loveseat, and if it’s presentable and comfortable I’ll use that. Otherwise, Ikea to the rescue again! The nice thing about this room is that the server room is on the other side of the wall. This means I can run the cables through the wall and put all of the computers with their loud, whiny fans in there, keeping the online room quiet. Designing an online edit suite, Part 1: Can I Afford It? This is the first in a series of posts I’m planning that will cover the budgeting, design, and possibly even construction of my own online editing suite. The whole plan could fall apart if the income doesn’t justify the cost, but my preliminary spreadsheet-fiddling has been promising. I left a staff position in September to become a freelance editor, and while I’m happy I made the switch, there’s one big problem I have: I don’t have my own editing suite. All I have is a copy of Avid that I use to edit my reel, and for basic editing that works fine. But the work I get paid for is color correction and online editing, and a dinky laptop is not powerful enough to handle that type of work. So far I’ve been able to work around the problem by using my clients’ equipment. I have a tablet and monitor calibrator that I bring to the gig, and I spend a few minutes getting everything set up. Even so, this means the color is inconsistent because I use a different monitor every time, and often the process is slowed down because the system I’m using isn’t fast enough. And frankly, I’m picky about ergonomics, so I get frustrated when the chair is uncomfortable or when the light isn’t right. To do this work properly, I really need my own edit suite. First and foremost, a fully-equipped online editing system is expensive. Can I get enough work to afford it? If I buy the system, will that allow me to do more work, or will I have to raise my rates to pay for it and therefore price myself out of the market? Taking advice from my girlfriend, I’m not going to let the price of the system determine how much work I need to bring in. I will try first to figure out how much work I can get, then see if that’s enough to pay the expenses. If the numbers don’t work, then I can’t afford the system. To know what I need to buy, I need to know exactly what I’m going to be using the system for. Based on the past couple months, I will continue finishing and grading independent projects in Final Cut and Apple Color, possibly outputting to various tape formats. I do not foresee working with high-res 2K 4:4:4 images, so I don’t need a super-fast RAID or the highest-end Kona card. Similarly, I’m not doing audio mixing, so while I don’t want tiny computer speakers, they don’t need to be stellar. This is just a rough back-of-the-envelope calculation. It does not include tax and shipping, for instance. But it serves to get me in the ballpark — 10 grand. That 10 grand, spread out over the lifetime of the various parts, comes to about 3700$/year that this system needs to bring in to justify itself. There are choices I’ve made that might be surprising: is a DreamColor really good enough for professional color grading work? Is 1TB of un-RAIDed storage a good idea? Should I get an Avid Mojo DX so I can finish in Avid as well? Or should I just get The Duck? Based on my experience, the DreamColor is a big step forward for LCD reference monitoring. It’s no high-end CRT, but for the price range I’m targeting it’s great. For most indie projects, 1TB of storage will be fine. As long as I back up project files, I’ll be working on duplicated media anyway. If the drive should die, the client will still have their own files. As for Avid compatibility, that’s up to the work I can get. Right now everyone is using FCP. But if I have to turn away Avid customers, I’ll have to consider the Duck or a Mojo DX. Ouch, double the cost. Have I complained yet about the high cost of Avid equipment? It’s really tough to justify a Mojo DX unless I get a big contract or something. Now that I have an idea of what the system looks like, what about where to put it? There’s more to a suite than the hardware and software. My next post will cover room design, desks, and other environmental considerations. Author OwenPosted on November 16, 2008 Categories Avid, Final Cut, Technical4 Comments on Designing an online edit suite, Part 1: Can I Afford It? Boingboing had a neat post about an “elect-o-meter” that one could hack up — basically a plastic cup that glows red or blue depending on who is winning the election. The purple will become more blue or more red depending on who is winning, and then when a winner is declared it will turn fully red or blue. 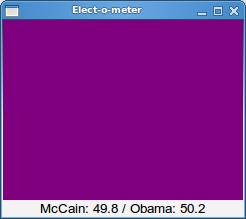 Because the purples are very difficult to discern by eye, I print the actual percentages below. Here’s the source code. Just run it on a Linux machine and it should work.